Almost all the greatest discoveries in astronomy have resulted from what we have elsewhere termed Residual Phenomena, of a qualitative or numerical kind, of such portions of the numerical or quantitative results of observation as remain outstanding and unaccounted for, after subducting and allowing for all that would result from the strict application of known principles. Outlines of Astronomy (1876), 626. Numerical logistic is that which employs numbers; symbolic logistic that which uses symbols, as, say, the letters of the alphabet. In Introduction to the Analytic Art (1591). 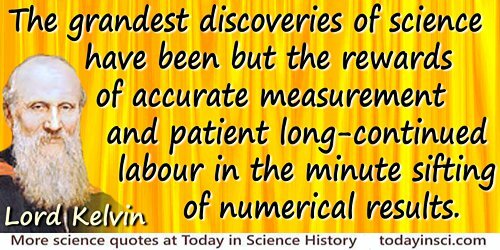 There is more danger of numerical sequences continued indefinitely than of trees growing up to heaven. Each will some time reach its greatest height. Grundgesetz der Arithmetik(1893), Vol. 2, Section 60, In P. Greach and M. Black (eds., Translations from the Philosophical Writings of Gottlob Frege (1952), 204.